I went into The Sea of Tranquility a little skeptical, a little excited, and just a little wary too. When novels have been hyped up, much like this one has, I always have to face the fear that it will disappoint me; that it won't be as good as I want it to be. With The Sea of Tranquility, however, I needn't have worried. Katja Millay's debut is flawlessly written, hitting the reader right in the gut, making them feel every emotion as if it were theirs. It's the type of contemporary that might as well have been written for me - slow-burn romance, heavily character-driven plot, flawed characters, and two tortured souls. It isn't a perfect novel - very few are, after all - but it is a novel that deserves its hype, its following, and to be read by every reader, no matter their genre preference. The Sea of Tranquility is not an easy novel to read. While its first half can be excruciatingly slow, developing our two main characters and enriching the plot, it's the second half of this heartbreaking story that, contrary from making me cry, made my entire body shake in fear, disgust, and sadness. It was the type of deep despair that renders your eyes tear-less, but your soul broken anyway. 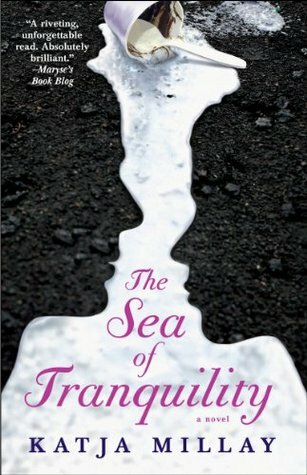 The Sea of Tranquility alternates between the perspectives of Nastya, the new girl in town, and Josh, the boy who has witnessed his entire family die before his eyes and, as such, the entire town leaves him alone. Nastya is broken, physically and mentally. While she keeps a tough exterior, a past traumatic experience is eating at her from the inside and against her own will, she is drawn to Josh, another kindred broken spirit. While their initial interactions are far from friendly, slowly the two of them begin to form an unlikely friendship and, most surprisingly, trust. While they seem impenetrable, obscure, and downright strange to the rest of the world, they find solace in one another and creeping manner in which their quirky friendship turns into love is incredible to behold. It's the type of slow-burn that will take your breath away and at the same time, you understand that the feelings these two have for one another run far deeper than simple affection; they are, for lack of a better term, each others family. In each other they find the redemption and comfort and understanding they don't even realize they're looking for or need to complete themselves. In addition to the romantic element, however, a heavy undertone of mystery remains present throughout the story. We, as the reader, are left in the dark when it comes to Nastya's mysterious past and while we can observe, physically, that she has scars and her left hand doesn't work quite alright, we still don't know what happened to her or the full extent of that mental damage. With alternating perspectives, we are witness to the slow changes that Josh and Nastya inflict upon each other, but we are also witness to glimpses of Nastya's past and if those flashes of horror don't frighten you, the eventual truth definitely will. I've mentioned that The Sea of Tranquility isn't a perfect novel - and it isn't. It is a deeply psychological tale of two tortured teens and it is told with a talent that I find breathtaking. Yet, the beginning of this story is rather slow. It takes awhile to get going, but once it does, you won't be able to put this down. Nevertheless, the most important part of this story, its ending, was strangely lacking. Millay spends chapters upon chapters building up Nastya and Josh into characters we love and she then spends chapters upon chapters creating their love story. Through all this, the reader is immediately sucked in and utterly invested in the tale. Once the drama begins to creep in, our hearts have been ripped out and when the eventual revelation of Nastya's past comes to light, our hearts are just shards of broken glass. Unfortunately, however, the manner in which Millay pieces them back together and glues them is a little...off. I truly enjoyed this novel and while my initial gut-reaction was to give this 5 Stars, I found, upon reflection, that I couldn't. The Sea of Tranquility is one of the most surprising, original, and heart-wrenching tales I've read - ever - but its ending left me a little unsatisfied. While I know many readers will disagree with me on this front, as they may have found the ending to be wholly satisfactory, I did think it was a little rushed. We are cheated of the opportunity to see Nastya grow and change and confront her past which she has been hiding from for such a long time. In fact, the monumental impact of Nastya's past is covered rather quickly in one chapter and then another very short epilogue of sorts. I found myself wishing for both a quick injection of Josh's perspective and perhaps even a more conclusive epilogue that revealed a little of Nastya's conditions after her ordeal. Normally, I would have been satisfied by the nicely wrapped-up ending, but I found that for a novel that spend so much time just introducing us to the characters and later creating their romance, the eventual revelation of their journey to discovering the truth about each other and dealing with it was a little short in comparison and just a tad-bit of a cop-out. Nevertheless, I cannot recommend this book enough. Truly, it is a story that took my breath away and the depth of emotion I felt for these characters is unparalleled. It's one of those novels that will stick with you for a long time to come, just because it is so different from everything else out there and the basic fact that it inspires so much feeling. I feel as if I know Nastya and Josh nearly as well as Katja Millay herself probably knows them - that is how well she enables you to understand these characters. Furthermore, the troubles they faced were realistic, were never over-dramatic, and the cast of secondary characters that graced this tale were beyond phenomenal. I cannot adequately express my awe for Millay or my love for this story - one that I will never forget - and I am already eagerly anticipating whatever Millay writes next. Truly, this is one novel you will regret missing out on. If it doesn't make you think or change your life just a little bit, then you're reading the wrong story. Thank you to NetGalley and Atria Books for providing me with a copy of this book in exchange for a honest review. I've never heard of this book before, but it looks like such a powerful read from your review. From the cover, I wouldn't have guessed that this is contemporary romance. I have a thing for emotional reads, so I'm pretty sure to enjoy this book. I'm dying to know what happened to Natsya although I have a do have an idea of what her past might be. It's good to hear that there is no insta-love in this book. I'm sorry that you were slightly unsatisfied by the ending, but it still it seems like the book had a great impact on you! I am very excited about this. My whole list of friend reviews on Goodreads is full of 4 and 5 star ratings. I'll keep in mind that you found it a little slow going at first, but I have a strong feeling I will enjoy this too. :) Beautiful review, Keertana! You know, I haven't heard of this book before. But now I'm very intrigued. The cover is really cool and the story sounds pretty good to. Great review, Keertana! This book is suddenly everywhere! I do have a copy from NG that I am hoping to get to in the next couple of weeks. It sounds as if this one is pretty strong, even with some flaws. I'm really looking forward to learning more about Nastasya and Josh! Excellent review, K! Awesome review, Keertana ♥ So glad you enjoyed it! Brill review, Keer! I only saw this pop up on Goodreads the other day and I just went and got it on Netgalley - thanks for the heads up! This sounds... intense and sad and like a book I know I need to read. Though I am a bit put off by the unsatisfying ending, but if the rest of the book is fantastic, then hopefully I won't mind too much! Your gorgeous review leaves me wanting to read this book as soon as I can, which is quite abnormal for me considering the book's pacing. I'm usually too impatient for slow books, but I actually really want to give this one a try. I'm sorry the ending wasn't satisfying for you, though. Thanks for the brilliant review, Keertana! I'll have to check this book out! O_o I guess this is another one of those books I'm too much of a coward to read (Please give me courage, Wozard of Oz!). Nastya (LOVE THE NAME) and Josh sound lovely and it's great that the author took the time to really make their characters solid, and THEN built their love story. Anything that has you writing one superlative after another (despite the unsatisfactory ending), simply forces me to beat my own cowardice. I will read it, and that is a promise. Oh my, this sounds like a MUST read! On my WL it goes! The romance sounds fantastic, I'm all for a slow burn romance! The bit that is a little 'off' definitely has me curious. I hate when that happens though, when a book is so close to perfect but just something isn't quite right. Stunning review! I'm sorry the ending didn't work as well for you as it did for me! I'm glad you loved the book otherwise, though. I'm actually not sure what I'll do if I actually come across a negative review one of these days, haha. Gah! I know exactly how you felt going into this book, because that's exactly how I feel about picking it up. Amazing review after amazing review (yours included) has me so nervous, and I'm really glad you actually included some of the imperfections to help balance things a bit. This really isn't my type of book, but anything done well is something I can love, so I will certainly be reading this one soon. I am FLOORED. This... just.... it.... WOW. Is there are more adequate word? The way you have captured the depth of EMOTION in this book is incredible. This wasn't even on my radar until your review and.... geez, girl, you know how to sell a book, don't you? It sounds so POWERFUL and crazy intense and I don't even know if my heart is prepared to handle such angst and pain and torment, but I don't care because when a novel like this comes along... you HAVE to read it. If you're looking for a reputable contextual advertising company, I recommend that you try PropellerAds. Guest Post at The Readventurer!